“Callings” is a poetic homa ge to the sirens of the sea and the secret intentions of the voices that captivate and haunt us. 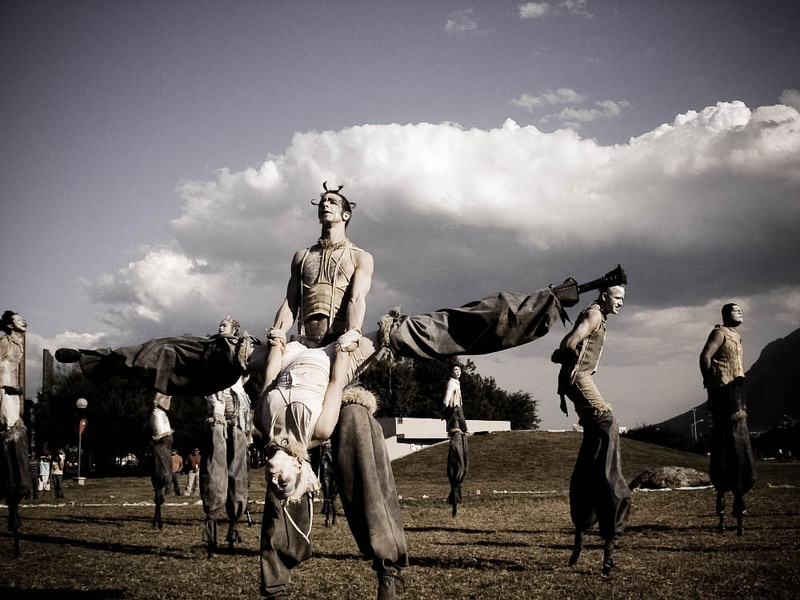 Created by The Carpetbag Brigade in 2011 and drawing on the The Carpetbag Brigade’s unique physical theater vocabulary of acrobatic stiltwalking, butoh dance and contact improvisation. Directed by Jay Ruby, Callings has been co-created by Isabelle Kirouac, Christopher Mankowski, Helen Godrum, Ashley Rodd and Kevin O’Connor. It has been presented at the San Francisco International Arts Festival (CA), Tsunami on the square Festival, Prescott (AZ) and many festivals in Colombia including the Iberoamericao Festival (Bogota), the Festival Internacional de Teatro de Manizales and the Festival Al Aire Puro (Bogota). Directed by Jay Ruby. Divised by Isabelle Kirouac, Anson Smith, Calder McBullwinkle, Kristen Greco. You don’t know Jack has been presented at many festivals and venues, including the Edinburgh Fringe Festival (Scotland), Performance West Festival (Los Angeles), Summit of Network of Ensemble Theater (San Francisco), etc. Blending contemporary dance, physical theater and stilt acrobatics, THE VANISHING POINT is a dreamlike physical poem evoking images of evolution and extinction. In a distinctive movement style drawing from Butoh and contact improvisation, THE VANISHING POINT creates a poetic and otherworldly spectacle of stilt creatures that transform repeatedly, evoking the wonder and sadness of what it means to be – or become – human. Directed by Kristen Greco. Performers are Isabelle Kirouac, Anson Smith, Dan Bear Davis, Aurelia Cohen, Kristen Greco, Jay Ruby. The Vanishing Point has been presented to many international festivals and venues from 2006-2011, including Forum International de las Culturas de Monterrey (Mexico), Festival Al Aire Puro (Colombia), San Francisco International Arts Festival (USA), Edinburgh Fringe Festival (Scotland), Clonmel Junction Festival (Ireland), etc. Bursting at the seams with surprises and splendors Penny Farthing takes a simple circus love story to the sky and beyond. 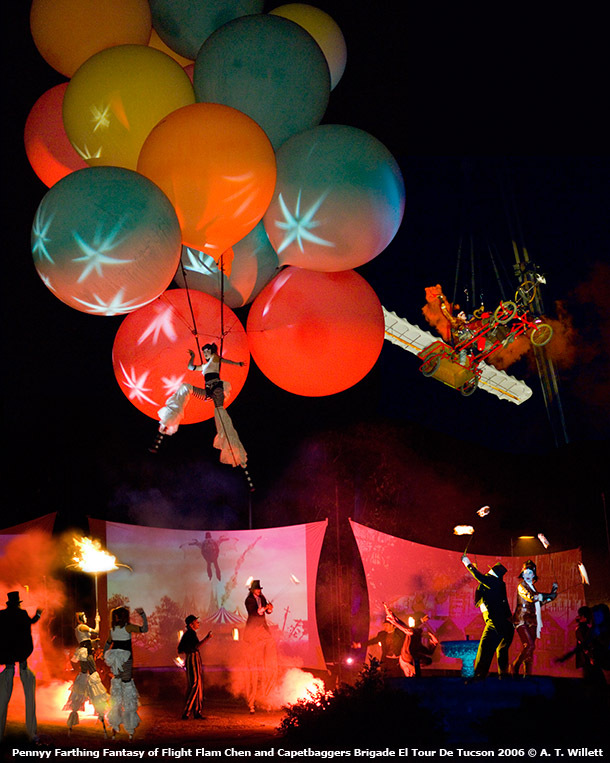 Pyrotechnic wizardry, choreographed acrobatic stiltwork, enchanting aerial dance, a bevy of mischievous clowns, flying machines, weather balloons, a metaphysical marching band, and a gypsy orchestra set in a Victorian atmosphere fulfill the circus-going desires of spectators. Penny Farthing was directed by Flam Chen, in collaboration with Carpetbag Brigade and video artist Adam Cooper-Teràn. It has been presented at El Tour de Tucson, in Arizona.